Q. What are the stains actually up on your roof? Most people will tell you its all from the trees, possibly from planes, leaf stains but all of these assumptions are wrong. The ugly black streaks are actually a blue-green algae known as Gloeocapsa Magma that is spread by airborne spores. These spores attack the lime that your shingles are made from. Q. What is the best way to clean this Gloeocapsa Magma? The absolute best way to clean an Asphalt roof and the only process that ARMA (Asphalt Roofing Manufacturers Association) Suggests is our no pressure roof cleaning solution process. We use a specialty formulated chemical combination to kill all the algae without the use of a pressure washer at all. Q. Will the chemical kill or at least damage our plants, grass, etc? Q. How long with this clean last? While every roof is different we can comfortably say that after we clean your roof it will stay clean a minimum of 3 years without any visible mold growth. The picture of the roof below was a roof we cleaned in Olney MD. It shows the cleaning process right after we sprayed it. The lighter portion is actually the bacteria growth dying. For a fraction of the cost of a roof replacement we can clean your roof with no pressure, keeping your home looking great and protecting the integrity of your roof. 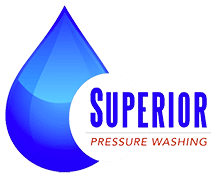 Visit www.SuperiorWash.net for your free estimate.